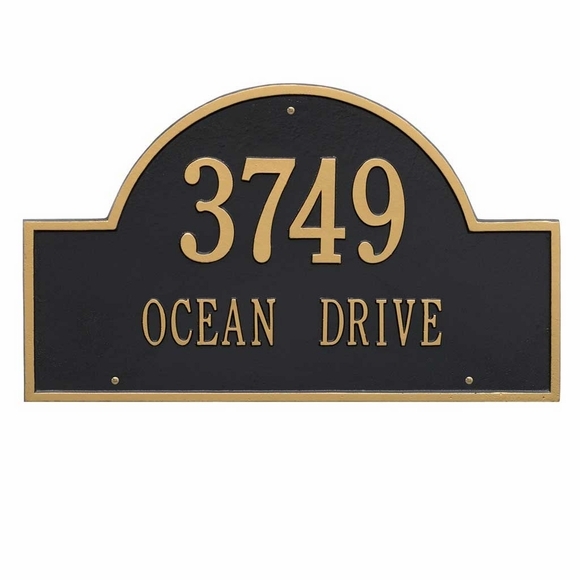 Arch Shape Address Plaque 15.75x 9.25 - - two-line address sign holds street number and street name. Made in USA. Surface mount on wall or on the impressive lawn mount address plaque holder shown above (click top link in Related Products for details). NOTE: personalized plaque and lawn mount holder ship separately. Line 1 holds up to five (5) 3"characters. Small images (from left to right): AB antique brass; AC antique copper; BG black plaque with gold characters; BS black plaque with silver characters; GG dark green plaque with gold characters; OB oil-rubbed bronze; OG bronze gold; PS pewter silver; RG red plaque with gold characters; and WG white plaque with gold characters. Address on this sign: 3749 Ocean Drive.